Bitter Winter has previously reported that several nursing homes were forcibly closed down because Christians participated in their establishment and that Christians who adhere to their faith were at risk of being expelled from nursing homes. Such a worrying situation is spreading across China. More than 70 lonely seniors and disabled persons, including some Christians, live at a nursing home located in a village under the administration of Henan Province’s Luoyang city. For them, the threat of being kicked out of the home is a tremendous danger. Thus, inspections by government officials are a constant source of anxiety for the patients. During one recent inspection, government officials threatened a disabled believer who refused to hand over his Bible, saying, “All the Bibles must be confiscated! No one is allowed to believe [in God] anymore! Anyone who resists will be sent away!” This is the second time in one month that authorities entered the nursing home unannounced to conduct an inspection. In the end, the disabled believer was forced to hand over his copy of the Bible. More than 50 religious books that were found during the two inspections by authorities were also confiscated. “The government doesn’t just make threats,” one elderly person said. Mr. Zheng, who guarded the entrance, was fired for allowing preachers to enter and leave the nursing home. Preachers have also been warned that they will be arrested if they go to the nursing home to preach again. Not only are residents in nursing homes being harassed and threatened, but homes themselves that were founded by Christians are being threatened with closure. Those that can be “saved” from such a fate can be considered lucky. One private home for the elderly in Liaoning Province’s Dandong city in northeastern China was nearly dissolved because of its Christian background. A few Christians took the initiative to establish this nonprofit facility to alleviate the burden on their children. Showing consideration for elderly believers who have limited mobility, a preacher came to the nursing home regularly to give sermons and helped residents resolve difficulties in their lives. Since June 2018, however, this home for senior citizens that has provided such charitable care has been subjected to repeated harassment and warnings from government personnel. One government official said, “If you want to enjoy life in retirement here, you are absolutely forbidden from believing in God. Otherwise, this nursing home will be closed down and dissolved immediately. In the future, the door must not be locked. We will come for an inspection at any time.” Government personnel also threatened the preacher who visited residents frequently, saying that if he continues to give assistance to these seniors, he will be arrested. One elderly person pleaded with the officer, “All of us are over 80 years old, and we’re very ill. It is difficult for us to get around, so we cannot go to the church.” The government officials were unmoved. Under pressure from the government, most of the residents and staff of the facility left, and only three seniors who had nowhere else to go stayed in the home with no one to take care of them. On top of that, having lost assistance from the church, these three seniors have to bear all of the nursing home’s expenses, placing them under immense economic pressure. Still, however, these seniors vow to keep going. 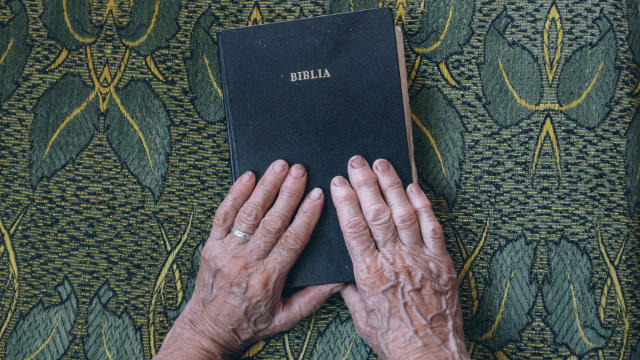 One senior carefully removed a Bible that he had wrapped in cloth and hid under his quilt. He said cherishingly yet helplessly, “The government doesn’t let us hold gatherings and read the Bible, so I have to remove it secretly and read it for a few moments. As soon as I see someone coming, I hurriedly put it in my pocket.” The senior’s sadness and helplessness are fully captured in these brief words.